Zac Hunter’s welcome return in the sequel to Justice For All. This time the ex-LAPD cop infiltrates the gangs of south central to find the kidnapped daughter of a former grass. Gang warfare is about to kick off big time. He was the best new PI last year... And this year he's back already! Ex-cop Zac Hunter is just wondering what to do with his life and how to make a difference without a badge when he's drawn into a new adventure. His old informant, gangbanger and babe extraordinaire Angel asks him for help when her daughter has been kidnapped. When Hunter investigates he finds out he's been caught in a web of lies and a maelstrom of violence. Along the way he meets a Native American vigilante, Stone, who's such an impressive character you get the feeling he deserves a novel of his own. It looks like he might be back in the next novel as a sidekick of some sort. Can't help thinking of the Lone Ranger and Tonto. Even more actionpacked then the first novel (Justice For All) that reminded me a lot of Michael Connellý this one takes you more into Lee Child territory. Worth it if you're into hardboiled action! Click here to read more. 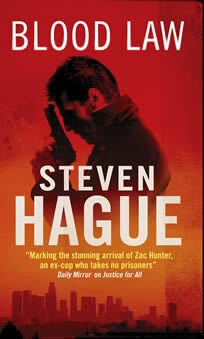 Zac Hunter is back in his second outing as the ex-cop, now Private Investigator. This thriller sees him drawn in to the gangland world of LA and it’s just as gritty and hard hitting as his previous novel, Justice For All. Urban noir with the cool, collected and very dangerous Zac Hunter. Click here to read more. Here's a rough, tough, thriller with the impact of a knuckleduster to the jaw. Fans of TV hit The Wire will connect with hero Zac Hunter, a former LA cop who answers a call from a former informant, a gang member, for help. Hunter is soon caught up in a dangerous street war as he tries to repay his debt to Angel. A real page turner…it is a thoroughly good read.